If my argument is for the importance of aesthetics within Godard's films and videos since the late 1980s, two kinds of questions quickly arise. First, if I am taking a tradition of philosophical aesthetics to be not only an interpretive framework but also explicitly present within these works, what evidence is there in the films and videos? Where does this concern manifest itself? Second, if aesthetics is as prominent as I am claiming, why have critics by and large failed to bring it up, much less discuss it as a central orientation? Though the primary purpose of this chapter is to work through the first question, to begin to discuss the place of aesthetics in Godard's late work, I'm going to start with the question about criticism, the question of why aesthetics has rarely figured in writing about these works. To a certain extent, I think this is a mistaken, if natural, way of phrasing the question. Aesthetics may not have received explicit attention in critical writing on Godard's late films and videos, but a range of associated terms (natural beauty, form, free play, and so on) are staples in the discourse. Yosefa Loshitzky, for example, discerns in Nouvelle vague a sustained treatment of natural beauty: "Nature is celebrated through adoring shots of the Swiss forests, lakes, and meadows which serve as contrapuntal points of reference to the decadent world of the power-lustful industrialists." But something is lost in the shift from aesthetics proper to terms that have been historically associated with the discourse of aesthetics. When Loshitzky talks about natural beauty, she treats it as a topic-in the way that industrial production and finance capital are treated in the films-that Godard has an opinion about. Thus, she concludes her discussion by noting: "The biblical, edenic associations of the garden emphasize the religious, utopian dimension of nature, envisioned by Godard as the last resort from late capitalism." From an observation about the presence of images of nature, Loshitzky draws a set of conclusions: to work in terms associated with aesthetics is to be uninterested in questions of history and politics, even to evince an idealist or conservative position. I'm going to spend much of this chapter laying the groundwork for a more expansive and intricate account of the role of aesthetics in Godard's films, one that encompasses modes of perception and experience, judgment and knowledge, and is wholly intertwined with history and politics. But what's needed is more than a revisiting of Godard's late work. The terms of criticism deployed in response to it emerge out of a long-standing tradition within film studies, one that minimizes or rejects aesthetics as a category of valuation. It's a tradition in which Godard himself played a prominent part. Getting clear about the nature of Godard's cinematic project in the late 1980s and 1990s will require working through and undoing central elements of this critical legacy. The place of aesthetics within film history, and within film studies as well, goes back to the first decades of the twentieth century. As film was struggling to be recognized as a genuine art, more than a mere recording of the world or a form of "canned theater," film critics and theorists frequently made use of terms from aesthetics to demonstrate the medium's artistic legitimacy. Film had emerged not in the context of high artistic culture, the spaces of the theater and the museum, but rather at the fairground, in the vaudeville theater, and in the traveling exhibition. As Tom Gunning argued, early films functioned as a "cinema of attractions": their appeals were predicated less on traditional artistic values than on the creation of sensory thrills, new experiences, and a direct solicitation of the viewer's attention. For this reason, early film has often been described as opposed to the bourgeois world of artistic cultivation. At a certain point, though, this began to change. In the 1910s, the period of "narrative integration," a number of filmmakers and critics sought to raise the standard of the cinema, to improve not only the films being made but also the character of the audiences watching them. They sought, in short, to give film the status of the other arts. Two basic strategies for this effort emerged. The first was articulated by D.W. Griffith in the wake of the controversy over The Birth of a Nation (1915). Decrying its censorship, Griffith argued that cinema's status as a legitimate art form was bound up with debates over the freedom of speech. Labeling cinema a "medium of expression," he wrote, "A people that would allow the suppression of this form of speech would unquestionably submit to the suppression of that which we all consider so highly, the printing press." This is the core of Griffith's argument: censorship of the press is forbidden by the Bill of Rights; the cinema is a "pictorial press"; therefore, the cinema cannot be censored, because it is on par with the printed word. As a result, Griffith concluded that "the development of the moving picture industry constitutes the birth of a new art," and so can claim the protection the law gives to artistic productions. The second strategy had to do with cultural legitimacy. Anton Kaes argues that, in the period from 1909 to 1920, "cinema felt pressure to legitimize itself vis-à-vis literature as the dominant medium" in cultural life. As it developed its own theaters and new forms of technology, cinema was able to "edge into a competitive relationship with mainstream literature, especially with the novel (which offered ready material for cinematic representation) and with the theater (which lost famous directors and actors to the new medium)." One version of this was the German "kino debatte" that Kaes describes; the more famous effort to integrate theater and film involved the French films d'art, in particular the use of actors from the Comédie-Française to create prestige productions (such as L'assassinat du duc de Guise [Charles Le Bargy, 1908]). Early theories of film emerged in the context of this debate. As Noël Carroll remarks, "The philosophy of the motion picture was born over the issue of whether film can be art." One example of this position was Vachel Lindsay's 1915 proclamation, "The motion picture is a great high art, not a process of commercial manufacture." Another was Hugo Münsterberg's use (in 1916) of the conceptual framework of Kant's theory of mind to explain the power of films to produce new kinds of (what he took to be almost unimaginable) experiences. A decade later Béla Bálazs invoked the terms of classical aesthetics, drawing in particular on Lessing's Laocoön, to argue that film needed to develop into "an autonomous art ruled by its own laws." Rudolf Arnheim also used Lessing as a reference in his description of the rules of art specific to film. The point for both Bálazs and Arnheim wasn't simply that film ought to be accorded the same respect as theater or painting in order to enable the appropriate appreciation; rather, the fact that a film could be treated in terms of aesthetics meant that it was on equal footing with the other arts. This line of argument finds its culmination in the art film, which, Dudley Andrew argues, "wants to make us choose to enter the theater just as we decide to go to a concert featuring Beethoven's sonata opus 111." The tendency to argue for film as high art, and to do so on terms drawn from aesthetics, had important consequences for later conceptualizations of film. One of these consequences involved the creation of the first institutional film collections. In New York, the Museum of Modern Art, along with the more specialized Anthology Film Archives, established a repository of the art of cinema, including experimental works as well as the films of Griffith, self-conscious cinematic "art" as well as that of Hollywood directors. Haidee Wasson has chronicled MoMA's efforts to raise cinema to the status of a genuine art; similarly, P. Adams Sitney described the Anthology Film Archives as being "made to formulate, acquire, and frequently exhibit a nuclear collection of the monuments of cinematic art." In France, a similar role was played by the Cinémathèque Français, founded by Henri Langlois and Georges Franju. (I discuss its importance for Godard in chapter 5.) Other nations, including Germany, Italy, and Japan, also established similar institutions in the middle of the twentieth century. Perhaps inevitably, the institutional celebration of film as an art and the linking of the terms of aesthetics to this project generated a movement away from this critical tradition. In 1954, for example, François Truffaut set out the parameters of the nouvelle vague in a denunciation of the "tradition of quality" in French cinema. Although Truffaut did not call for the wholesale elimination of aesthetics or art, he argued vehemently against using other arts to add to the prestige of film. His goal was a reorientation of aesthetic value, an end to adapting works of "quality" for the screen in favor of a cinema that would be truer to the authentic possibilities of the medium itself. Truffaut was only an early marker of this criticism. As filmmakers and theorists began to disavow art cinema in the 1960s and 1970s, they rejected the terms of aesthetics altogether. When Laura Mulvey argued in 1975 that the role of criticism was to destroy "pleasure, or beauty," her intent was not to provide a new account of aesthetic value but rather to overturn an entire tradition of aesthetic valuation. The political rejection or suspicion of aesthetic criteria exemplified by Mulvey's early work permeated a wide range of critical methods. Saussurean structuralist semiotics, as it was picked up in film studies, turned language into the central model for analysis, bypassing considerations of aesthetics by turning the viewer into a decoder of a text. Psychoanalytic accounts of cinema either described film viewing in terms of theories of individual development or explored analogies (between the screen and a Lacanian "mirror," for example) to understand the social function of cinema. And "apparatus theory" rejected the indeterminacy of aesthetic considerations in favor of an analysis of the viewing position created by the combination of a camera based in Renaissance perspective and the spatial arrangement of theatrical exhibition. These critical methods became sufficiently prominent to allow Dudley Andrew, in 1984, to say with assurance, "The word 'aesthetics' has nearly dropped from the vocabulary of film theory." Taken together, these methods constituted a movement that D.N. Rodowick has labeled "political modernism." Rather than drawing on a tradition of art cinema, filmmakers and theorists claimed a lineage defined by left-wing criticism of mass media. The suspicion of artistic "aura" that had been voiced by Benjamin and Brecht in the 1930s returned as an argument that film ought to function as a form of "ideology critique" of and through its own institutional position. This meant not just advocating radical political goals but also exposing the conventions on which "bourgeois cinema" was based, from narrative patterns to the material status of the image-an effort to unlearn, decode, and reject the habits viewers had gathered from "naïve" moviegoing. Political modernism thus rejected not only Hollywood cinema but the art house tradition as well, a position voiced most explicitly in Fernando Solanas and Octavio Getino's call for a "third cinema." Godard's films from the late 1960s and 1970s were not simply part of the burgeoning growth of political modernism. His work in these years and the production methods he employed served as one of its primary models. Of particular importance was the way Godard sought to find a cinematic form that would be adequate to the political concerns he wanted to express and at the same time tried to discover a politics that would be adequate to the formal innovations he was exploring. As he noted, "We have not yet learned to watch and listen to a film. And therein lies our most important task today. For example, those who are politically aware are rarely cinematographically aware as well, and vice versa. Generally it's one or the other. As for myself, I owe my political formation to the cinema, and I think this is comparatively rare at present." This line of argument emphasized systems of media as the central place for political interrogation, suggesting that filmmakers face a moral and political imperative to challenge and upend the familiar systems of representation and production on which they draw. Le gai savoir (1969) may be Godard's most explicit version of this project, with its self-proclaimed mission to "start from zero" and construct a new, and free, language of image, text, and sound. It's hard to overstate Godard's influence on film theory in these years. Partly, this influence had to do with the films themselves, the way they articulate a pressing political need to rethink the basic elements of film practice. But it correlates with other historical changes as well: while these films were being made, and in the wake of their influence on international film production-an influence that was intense and deep, although not quite as widespread as the influence of his films of the nouvelle vague period-film studies were emerging as an academic discipline. I suspect there's something to the thought that trends in film studies respond to the films of the time (or perhaps to the films just before their time), and so the rise of "theory" in the 1970s built on the foundation laid by Godard's work a few years earlier. While there have been recent attempts to "reclaim" art cinema from accusations of its cultural and political conservatism, I am concerned here with the way the legacy of political modernism shaped the reception of Godard's films and videos from the 1980s onward. It was precisely the importance of the Groupe Dziga Vertov films for a generation of filmmakers and scholars that led to the subsequent charges of nostalgia or naïveté against Godard's later work. Reading critical pieces from the 1980s and 1990s, one is often struck by a tone of betrayal and the repeated description of Godard's later films as amounting to a withdrawal from the political concerns that motivated his turn away from art and aesthetics in the first place. Frequently, the criticisms are expressed in terms of a fall: having once been at the vanguard of a cinematic and political movement, Godard's films and videos now evince little or no interest in those commitments. His films, that is, explicitly draw on and endorse a tradition of high art and culture (painting in Passion, music in Prénom Carmen, theology in Je vous salue, Marie, literature in King Lear) in a way that directly goes against the grain of the films from the previous decade. This criticism is further grounded by an apparent correlation with biographical facts. In the wake of the failure of his collaboration with Jean-Pierre Gorin and the dissolution of the Groupe Dziga Vertov, as well as a devastating motorcycle accident, Godard founded a new studio, Sonimage, with Anne-Marie Miéville in 1972. He did so, however, not in Paris but in Grenoble, eventually moving to the Swiss town of Rolle in 1977. MacCabe argued in 1979 that this geographical shift changed the nature of Godard's interest in both cinema and politics: "Sonimage's move from Paris to Grenoble and then to Rolle becomes the analogue of confronting the solitude that cities impose but disavow. ... [This position's] weakness is its concomitant refusal to consider the possibility of the creation of social meaning, of the grounds of social action." As MacCabe sees it, Godard's move marks a turn away from a belief in the importance of political action, a turn represented by his embrace of the idea of solitude. Like Rousseau's solitary wanderer, Godard withdraws in self-imposed exile from Paris to Switzerland in order to free himself from the complexities of the world of history and politics, the world in which public events take place. Away from the urban centers of Europe, he seems comfortable in a role as a cinematic and political outsider. To an extent, this reading is born out in Godard's work. His collaborations with Miéville during the 1970s, for example, frequently turn toward the question of the home. At times, as in Ici et ailleurs (1974), this is figured as simultaneously national and domestic: about the role of France in producing images of non-Western struggle and about the role of the household in maintaining the political order. Elsewhere, as in Numéro deux (1975), the focus is on the family unit itself: the relation between industrial and domestic work, the tensions between generations, and the sexual manifestations of larger social and political frustrations. While overtly political, these films eschew Godard's earlier commitments, exhibiting suspicion of any demand to place film in the service of revolutionary activity. This tendency increased when Godard "returned" to feature filmmaking in the 1980s, as a number of his characters evince a profound anxiety about their place in public or political life. The three films with which I am mostly concerned are not exceptions. In Soigne ta droite, "the Individual" worries about the way his identity is threatened by amorphous and impersonal forces. He shies away from figures of paternal authority, the dehumanization of rote manual work, and the negligence of political parties. In Nouvelle vague, Roger Lennox finds himself unable to comprehend the networks of financial institutions into which he has been placed, repeatedly rejecting the public roles he is given. In Allemagne 90 neuf zéro, Lemmy Caution struggles to understand the effects of the political movements that swept back and forth across Europe in the twentieth century-changes in which he played no role as a political actor-as he wanders through the ruins of its epicenter. In these films, Godard repeatedly shows characters residing in private existence or expressing a desire to be in such a state. Critics have wanted his films to show that countering such a condition of isolation is important, whether politically or morally. But Godard appears unwilling or unable to do this. Soigne ta droite ends with a poetic meditation on myth and creation, spoken over a view of a sunset through the window of an uninhabited beach house; Nouvelle vague finishes with the central couple rejecting the demands of capitalism, not for political rebellion but in favor of the intricacies and intimacies of love; and Allemagne 90 neuf zéro shows Caution alone in a hotel room, isolated from a world that has changed without him. There is little to indicate that Godard sees solitude as a problem to be actively countered. It's here that the traditions of debates over art, aesthetics, and film come together. When critics see Godard's turn away from public affairs, they also observe an increasing interest in the legacy of high art. As a result, a variety of discourses-solitude and politics, art and aesthetics-become mixed together, more or less equated. In this mixing, the terms and categories of art (and of aesthetics as well) are linked to Godard's turn away from political commitment; correspondingly, when he shows interest in art, he is taken to be withdrawing from the political world. An aesthete at heart. Many of the arguments I will make in this book go against this way of thinking about Godard's late work. Rather than refuting the charges of these criticisms, however, I will try to redefine the basic terms of discussion, since it's in the way questions are asked that this particular line of interpretation gets going in the first place. Crucially, this involves understanding the place of aesthetics in Godard's late films and videos in a very different way. Part of the difficulty in coming to terms with Godard's late work is the desire to employ models of political cinema largely derived from the 1960s: as an instrumental support for a political movement or as a politically motivated deconstruction of a dominant ideology or paradigm. Godard's films and videos since the 1980s, however, follow a different model, oriented more by a project of historical understanding. One reason for this change has to do with historical events. The 1970s and early 1980s witnessed the failure of revolutionary energy across international borders, coupled with the rise of right-wing figures, ranging from Reagan and Thatcher to Pinochet and Videla. In the midst of the reaction from the right, the self-evidence of what counted as political cinema was lost, and it began to splinter and dissipate. One of the major forms that political cinema now took involved a newfound engagement with history. In films such as Chris Marker's Le fond de l'air est rouge (A Grin without a Cat, 1977), cinema became a way to understand history, a tool by which history could be analyzed rather than changed. Godard's late work is part of this tendency, as he explicitly takes up investigations into the way the contemporary world has arrived at its current situation, how its transformations should be thought about, and the role cinema can play in this endeavor. Put another way, his films and videos still involve questions that preoccupied him in the era of political modernism-questions about politics, history, and society, and about the place of cinema within them-but they are now cast in a different form and arrive at different kinds of answers. Godard's cinema follows a model that might be labeled "diagnostic," oriented by a concern with historical understanding rather than political transformation (perhaps reversing Marx's line about Feuerbach). The diagnostic model can be seen in the way many of his films use political events as their narrative frame: Chernobyl for King Lear, the fall of the Berlin Wall for Allemagne 90 neuf zéro, the dissolution of Yugoslavia and the subsequent wars for Hélas pour moi (1993), Je vous salue, Sarajevo (1993), For Ever Mozart, and Notre musique. By explicitly positioning his films in relation to political events, Godard makes them available to be read as responses to those situations. He ensures that a given trope, technique, quotation, or image does not function in isolation, as a self-enclosed topic, but rather as an engagement, obliquely or directly, with a contemporary event or crisis. Taking a political cinema to define itself through its response to a situation may feel odd, especially given Godard's history as a committed filmmaker. Yet he has been attracted to this approach ever since the opening lines of Le petit soldat announced, "The time for action is over. I have aged. The time for reflection is beginning." The diagnostic model provides a way to understand the role of solitude in Godard's late work. Rather than signaling a withdrawal from the social, political, and historical world, Godard uses the motif of solitude to engage with and rethink these very concerns. That is, the desire for solitude is treated less as a value in its own right than as a response to a political context, to the tragedies of the twentieth century and the anxieties that emerge forcefully toward its end. In each film, he articulates a public context that serves, with varying degrees of specificity, as the occasion for a withdrawal into privacy or isolation. Critics are right, then, to say that Godard is relatively uninterested in passing judgment on whether one should be in a state of solitude; he simply takes it to be the case that solitude is a comprehensible response to certain social and political situations. But this is not equivalent to a full-scale withdrawal from politics by the film itself: Godard uses solitude, or at least the impulse to seek solitude, as a diagnostic tool. The particular form that solitude takes can then be used to think through the public conditions that motivate it. The first intertitle of Allemagne 90 neuf zéro, "Solitudes: un état et des variations" (Solitude: A State and Variations), already plays with the line between private and public, since a state (un état) is a category at once individual (a state of mind) and social (a nation-state). As the film goes on, Godard brings them together by developing the odd idea that the state, as a political entity, has achieved or desires to achieve the condition of solitude. (As he put it in an interview, "I did not want to make a film on the solitude of lovers or drug addicts. I found more interest in the solitude of a land [un pays], a state, a collective.") Late in the film, Caution remarks, "The dream of the state is to be alone; the dream of the individual is to be two," over a title that reads "Categorical Imperative." Unlike states, individuals are not described as seeking out solitude as much as seeking out one another. The suggestion here is that the state acts to rid itself of competing voices, the critique of individuals, since each time Godard uses these lines in a film he notes that their author was killed by the Nazis. More generally, Caution appears to be pointing to a familiar distinction between two models of society, one based on the organization of individuals and one based on the idea of a self-sustaining state. Godard builds up to the relation between individuals and the state in a sequence that draws on some of the central political conflicts of the twentieth century. It begins with a title, "The Time of Contempt," and we are shown several clips of Nazi and Soviet soldiers accompanied by an audio recording from a Nazi-era radio address: "There is a whisper from every continent rising up against the Soviet Union." Caution's voice is then heard: "In this atmosphere I could not find my place. The Comintern was not what it had been in 1923 [the last year of Lenin's rule]." Godard then cuts to a bar, where people are drinking, talking, or staring into space; an early Marlene Dietrich song plays on the soundtrack, as if from a jukebox. The text Caution reads is from the autobiography of Jan Valtin, an active member of the maritime division of the German Communist Party from 1918 until his capture by the Gestapo in 1933. It's a reference Godard wants us to pick up on, since we will shortly see Caution seated at a table with Valtin's book in a French translation; another man at the table is reading the German edition. Caution continues in voice-over: "And neither was I the same youngster who had stormed police strongholds and fought behind barricades with a gun in my hand. Firelei [Valtin's wife] now meant more to me than Josef Stalin or the Soviet Constitution." From the standpoint of the 1936 Communist Party, the time of the purges, Valtin speaks wistfully about the incompatibility of a private life with the duties of a revolutionary. Godard's use of Valtin's text gives a particular slant to the film's depiction of the desire for solitude. The fantasy of a private life, as articulated by Valtin (via Caution), is treated as a disillusioned response to the history of left-wing or socialist politics in the twentieth century, whether in the 1930s or the 1980s. The implication is that fatigue with political action produces the dream of withdrawal, that it is not a simple indifference to politics. Part of the force of this scene comes from the way Godard adapts a strategy from Rainer Werner Fassbinder's The Marriage of Maria Braun (1978). There, Fassbinder explores how the drive for economic self-advancement in postwar Germany deferred or displaced a genuine acknowledgment of the nation's involvement in World War II. Among several techniques he uses to show this is the staging of famous radio addresses from postwar German political life against scenes of private activity, usually eating, thereby correlating personal lives with public events. The most shocking instance is when, late in the film, Maria Braun hears Adenauer's announcement of Germany's rearmament while she eats lunch; rising up from her table, she staggers to the side and vomits. Fassbinder suggests that the effects of unacknowledged and ignored political events exist not just in the social sphere but in the individual body; neuroses and other pathological or destructive behaviors are the result. The bar scene in Allemagne 90 neuf zéro follows a similar pattern. Not only does it share with The Marriage of Maria Braun a color palette of browns and grays, but Godard also adopts Fassbinder's use of sound: we hear a radio announcement that German ships are being sent into the Persian Gulf to sweep for mines ahead of the upcoming invasion of Iraq, a controversial moment in contemporaneous German history. For the first time since the end of World War II, German armed forces were involved in an international conflict. As I will argue later in the chapter, one of Godard's main anxieties in Allemagne 90 neuf zéro is over the return to "normalcy" in German national self-identity, part of which involved its remilitarization. But even though both Godard and Fassbinder use the responses and desires of individuals as a way to understand larger social and political changes, there is an important difference. Fassbinder focuses on the way individuals, immersed in private activity, register political events unconsciously; he is concerned with the dangers of failing to acknowledge the existence of a political world. Godard, by contrast, gives us characters all too aware of politics; Valtin's life constitutes the exemplary form of this position. In this way, Allemagne 90 neuf zéro uses political narratives and visual strategies from across the twentieth century to articulate a new crisis for political actors: the end of the socialist alternative, however compromised it might have been, that East Germany represented. And with it is a worry over the very possibility of political engagement. Godard ends the scene on a somber note, suggesting that the desire for a private life separate from battles in the public sphere may be understandable on political grounds but is nonetheless an illusory fantasy. As Caution and the other man sit and read Valtin's book, we hear a phrase from Hegel spoken by the narrator in voice-over: "In following their own interests, individuals make history and are at the same time the means of something higher and greater, of which they are ignorant and which they fulfill unconsciously." Seen from a wider historical perspective, public and private are not separable realms but inextricably interwoven with each other. Godard suggests, albeit with a tone of sadness and resignation, that we are all, willingly or not, caught up in larger political movements and the course of (world) history. The desire for absolute privacy, for living a life not connected to public and political events, involves a fantasy that history continues to prove unrealizable. Allemagne 90 neuf zéro may constitute the most complex and explicit negotiation of the political dimension of solitude in Godard's work of these years. But if Soigne ta droite and Nouvelle vague lack the brilliance of the later film, a similar structure of engagement with solitude is nonetheless present within them. The use of solitude in Allemagne 90 neuf zéro is not an isolated treatment so much as the culmination of arguments and experiments in the opening sequences of the two previous films. Soigne ta droite begins with its title in white lettering on a black background, over which we hear the sound of a telephone ringing. This is followed by a series of aerial shots-a forest suffused with fog, fields, rural towns, and lakes-as a voice says, "At the end of the twentieth century, the Idiot's phone rang. He's through with work, about to spend a quiet evening, as one still can in some remote areas of Europe, lost between the forests of Germany and the lakes of northern Italy. That's when the phone rings ... just then!" A stranger is calling, saying that the Idiot's sins (unnamed but apparently many) will be forgiven if he makes a film and delivers it that afternoon; a car is waiting for him, so is a plane ticket; he is to leave immediately. Apparently, the icons of industrial modernity aren't so distant after all. The opening scene presents the Idiot as a modern Rousseau, withdrawn to one of the few remaining "remote areas" in order to escape the presence of others, to achieve the "complete renunciation of the world." This turns out to be impossible, in part because people continually intrude on his solitude. Like Rousseau, he is disturbed, brought out, made to engage with the intrigues of the world once again. But the Idiot's desire for solitude is more a response to the public world than a flight motivated by private affairs and a feeling of persecution by one-time friends. Soigne ta droite gives this desire an increasingly broad motivation, culminating in Godard's extraordinary updating of the train scene from La chinoise. Instead of having Anne Wiazemsky and Francis Jeanson debate the validity of revolutionary terror, Godard shows a despairing conversation between two older men, both of whom are members of the Communist Party (or an equivalent organization). One is being taken to the border in handcuffs, where he will be sent away to be executed; their extended conversation revolves around the historical failure of radical politics and its misfiring attempts to incorporate radical art. (I discuss the train scene further in the next chapter.) In this scene, and in others throughout the film, Godard presents the public world, the world that surrounds individuals, as a profoundly unattractive place. The political failures of the twentieth century, seen from the vantage point of its end, have taken away the public arena in which the possibility for political action once resided. The problem is even more explicit in Nouvelle vague. The appearance of the motif of solitude in the opening shots of the film marks a radicalization of the term: solitude becomes less a withdrawal from the public or social world than a flight from the physical world itself. Over a black screen with the film's title in white lettering, a male voice says, "But I wanted this to be a narrative [Mais c'est un récit que je voulais faire]. I still do. Nothing from outside to distract from memory." There is an initial confusion here. The deictic this in the first statement appears to refer to the film we're currently watching, but the verb is in the past tense: its author "wanted this to be a narrative." Although it might imply that the film Godard made simply isn't a narrative, "I still do" indicates that the speaker may instead be articulating a worry that it won't be one. (In some ways, this is familiar territory for Godard: what matters is less the content of a narrative than the desire for one.) At the same time, he suggests that the desired narrative might come from memory, the mind separated from the world present to the senses. Yet if memory, as represented by the black screen, is to be separated from the world ("nothing from outside"), then how should we understand that desire? Is the narrator fantasizing that, with our eyes closed or the screen empty, the world is shut out, and a narrative can begin that will draw solely on memory? Is the film, or the audience, to be blocked off to allow memory to emerge? Or is the film the source of that memory? However we understand it, the fantasy of memory quickly dissolves as Godard cuts from the black screen to a shot of a tree, branches overhanging a verdant field, with two horses grazing in the background (figure 3). It's a beautiful, almost idyllic, image-and emphatically part of the world. It's as if the world itself were insisting on its presence, refusing to let the narrator organize the film according to his dictates; it is this tree, here in the world (of the film) that matters. Any desire for absolute solitude is shown to be unrealizable, perhaps even undesirable. Do we want to lose the sensuous qualities of the world? Even if we do, can we willfully ignore them? The interplay between solitude and world continues to develop over the next few shots. The voice-over immediately tries to reassert the power of narrative over the external world by drawing the tree into the terms of memory. It says, "I barely hear, from time to time, the earth's soft moan, one ripple breaking the surface. I am content with the shade [ombre]"-we go back to the credits, which now read "Alain Delon," the speaker of the voice-over-"of a single poplar, tall behind me in its mourning." If we must have something of the world, it will be only minimal. Again, Godard immediately shows the world (of the film) as refusing this desire, though now on different terms. There is a cut to a close-up of a left hand, horizontally extended from the left edge of the frame with its palm presented to the viewer. A landscape, as if from a painting by Poussin, recedes into the distance, while another hand, a right hand closed in a fist, comes into the frame from below and is enfolded within the grasp of the left hand. It's important that we can tell they are the hands of two different people: the placement of one hand into the other thus functions as an emblem of human connection, a sense of togetherness. It turns out that we need other people as well. Nouvelle vague repeatedly returns to the image of two hands clasped together, generally using it to stand for a relation-of loving, caring, giving, acknowledging-between a couple. But if the image of hands functions as a refutation of solitude in the opening moments of the film, at other moments its significance is less certain. Seen under the auspices of a broader public world, the image of twoness, in its most basic form, suggests withdrawal from or indifference to that world, a retreat to interpersonal intimacy. Perhaps it suffices for our happiness to have one person who responds to us in an appropriate way; perhaps no political or social solution is needed. And yet a recurrent anxiety about the contemporary world runs throughout the film, as characters repeatedly express confusion about how to understand the economic and political system in which they find themselves. In one instance, a banker notes, "In the past, such rampant manipulation of credit and debit always led to major disaster," and wonders why this doesn't seem to be happening then. When placed in this context, Godard's interest in the form of twoness reads more as a calculated strategy in response to confusion and anxiety about the public world than it does as a reflexive withdrawal from that world. The difference is subtle but significant. In the absence of clear knowledge of what's happening or of what we should do, Godard stages a retreat in the direction of the couple, a retreat that occurs with full recognition of the complexities of the public world. Across these three films, then, Godard gives multiple accounts of the nature of solitude, including a withdrawal from political action, the rejection of the social world, and a retreat to the romantic couple. In each case, the form of solitude depicted is predicated on the kind of situation being escaped. With the ravages of political activism, we have the fantasy of bourgeois privacy; with the impositions of the public world, we have social isolation; with the demands of finance, we have the solace of love. Importantly, in each film the flight into solitude is shown as failing to sustain itself. The terms of failure are different each time-Caution is still within the political sphere, the Idiot is made to face the world again, and Roger and Elena cannot escape entanglement with the intricacies of power and money-but the result is the same: solitude turns out to be impossible to achieve, much less sustain. In turning from solitude to aesthetics, we run the danger of treating them as similar kinds of things and so carrying associations from one to the other. The risk is in, among other things, returning to the approach I criticized above, in which aesthetics is treated as a topic, and certain images are taken to be the entire content of aesthetics. But the move has two advantages. First, it allows aesthetics to emerge in a way that lets it function as a mode of analysis; aesthetics is not simply something in the film, but a way of thinking that does work for the film. Second, and more important, the investigation of solitude should rid us of the assumption that we know what the category of aesthetics means in these films. A guiding principle of this chapter, and of the book as a whole, is that the terms of aesthetics, at least as they operate for Godard, cannot be given in advance. This principle is largely methodological. Aesthetics is not so much a topic within a larger discourse as it is the very means by which that discourse is pursued. However, I'll also argue that aesthetics enters the picture in no small way because of Godard's sense that other methods of inquiry and analysis have reached a dead end or come up against their own limitations. In this context, he uses the categories and terms of aesthetics to reformulate basic questions of historical and political understanding, and he does so by exploring the resources of aesthetics in and through cinema. With Late Godard and the Possibilities of Cinema, Daniel Morgan makes a significant contribution to scholarship on Jean-Luc Godard, especially his films and videos since the late 1980s, some of the most notoriously difficult works in contemporary cinema. Through detailed analyses of extended sequences, technical innovations, and formal experiments, Morgan provides an original interpretation of a series of several internally related films—Soigne ta droite (Keep Your Right Up, 1987), Nouvelle vague (New Wave, 1990), and Allemagne 90 neuf zéro (Germany 90 Nine Zero, 1991)—and the monumental late video work, Histoire(s) du cinéma (1988-1998). Taking up a range of topics, including the role of nature and natural beauty, the relation between history and cinema, and the interactions between film and video, the book provides a distinctive account of the cinematic and intellectual ambitions of Godard’s late work. At the same time, Late Godard and the Possibilities of Cinema provides a new direction for the fields of film and philosophy by drawing on the idealist and romantic tradition of philosophical aesthetics, which rarely finds an articulation within film studies. In using the tradition of aesthetics to illuminate Godard’s late films and videos, Morgan shows that these works transform the basic terms and categories of aesthetics in and for the cinema. Daniel Morgan is Assistant Professor of Film Studies at the University of Pittsburgh. “Late Godard and the Possibilities of Cinema is an exhilarating and extremely lucid analysis of the way Godard ‘thinks’ in, of, and through cinema. Drawing on his extensive knowledge of French culture, politics and theory, Morgan skillfully illustrates the complex relations between history, aesthetics, and nature in the director’s later works. 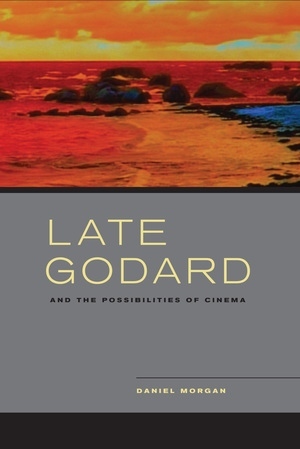 Defying criticism of Godard’s alleged retreat from politics, this book provides compelling, detailed, and erudite analyses of his later films and illuminates the auteur’s political and aesthetic response to the so-called ‘death of cinema.’”— Mary Ann Doane, author of The Emergence of Cinematic Time: Modernity, Contingency, the Archive. “Daniel Morgan charts a sensible route into the impenetrable Jean-Luc Godard. Posing clear yet insistent questions, he burrows to the center of both parts of this book’s formidable title, finding in late Godard an aesthetic fusion that generates the light and heat of a trenchant and powerful political critique. Anyone who feels drawn or licensed to write about Godard should read Morgan before setting out.”—Dudley Andrew, author of What Cinema Is!